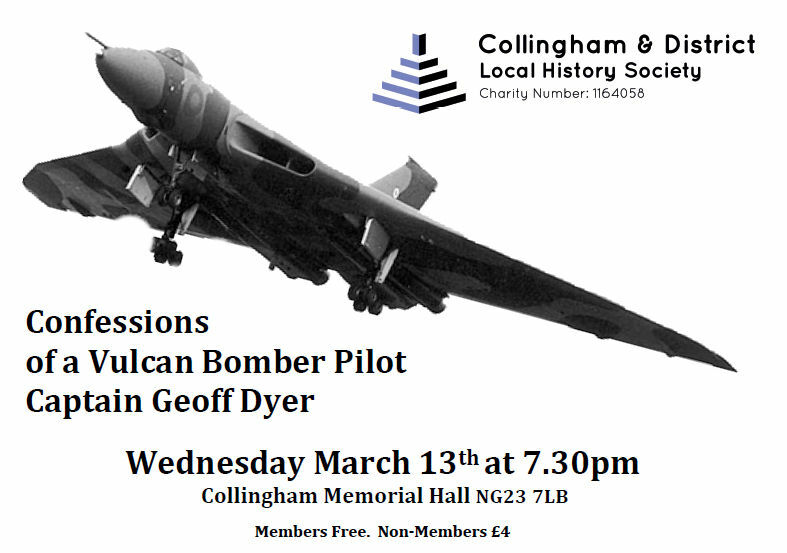 Captain Geoff Dyer’s presentation on March 13 drew one of the Society’s largest audiences; perhaps unsurprising given the local importance of the RAF. In fact, those present included other past crew members. Given his 10,000 hours of pilot experience and his studies in aviation history, Captain Dyer was more than qualified to give a rounded and fascinating view of life behind the scenes in the RAF during the Cold War. In 1946 it was understood that any future war would be nuclear and that the potential enemy would be Russia. Captain Dyer highlighted the enormous and rapid development during that crucial period; there were just seven years between the Lancaster and the Vulcan. The World War ll Lancaster carried around five tonnes of bombs whilst the Vulcan carried two million tonnes of TNT; and in the event that just one got through to Russia it could have wiped out Moscow. Issues around the Vulcan’s design and its construction , as well as the responsibility of the captain for the rear crew who didn’t have the safety of ejection seats were also covered as were the experiences of being a test pilot and demonstration flying. But this presentation also had its lighter side; we heard about how the captain’s biggest responsibility was to stop the crew from misbehaving during stop-overs and how exercises over Canada provided opportunities to bring back large quantities of whisky – custom officers’ inspections were thwarted by hiding the bottles up the nose in the scanner bay. This entry was posted in Meeting Reports on 13th March 2019 by Christine. This man’s been beating a good woman’. This entry was posted in Meeting Reports on 6th February 2019 by Christine. 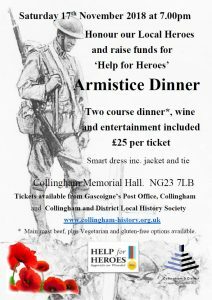 The Society organized a formal dinner to remember the Armistice on 17th November 2018 to bring a close to our commemorative events. Over 50 people enjoyed a very good evening and a wonderful meal of roast beef carved at each table. Everyone dressed up for the occasion and following the meal poems on the Great War were read out by Marion Collins, Helena Narracott and Nigel Priestley. Well known favourite songs from the period including ‘Keep the Home Fires Burning’ and ‘Mademoiselle from Armentieres’ were sung as a finale, with Anne Speed leading on the piano. 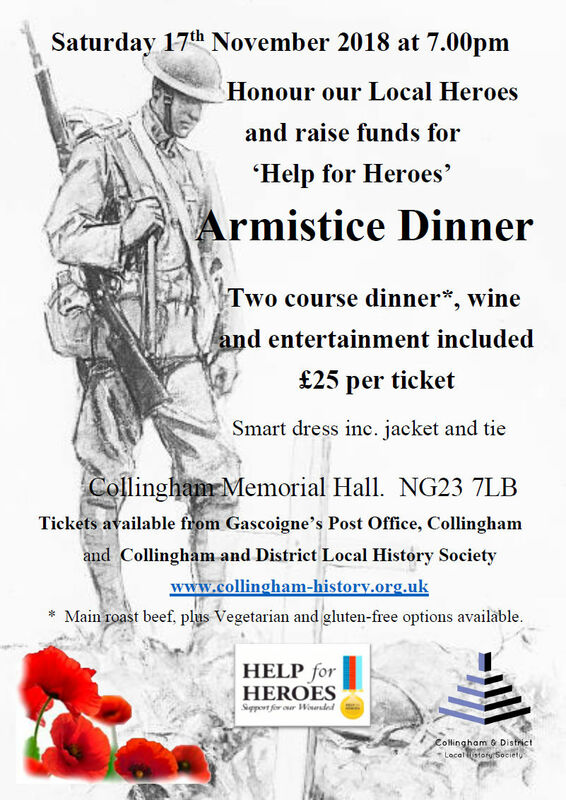 Several hundred pounds was raised for Help for Heroes from the raffle and dinner. The final sum will be announced shortly and at our AGM. This entry was posted in WW1 Armistice on 17th November 2018 by Christine. This entry was posted in Exhibitions, WW1 Armistice on 9th November 2018 by Christine. On the 7th of November the Society launched its programme marking the anniversary of the Armistice in 1918, with the story of Lincoln’s role in creating the first military tanks. 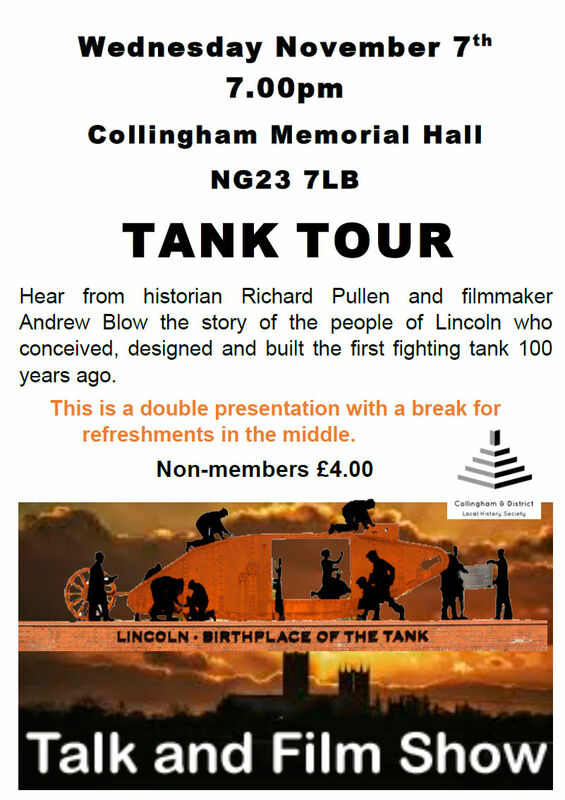 A record number of members and visitors came to the Memorial Hall to hear military historian Richard Pullen and filmmaker Andrew Blow recreate the story of the ‘Land ships of Lincoln’ and how the development of these military tanks became a major factor in saving lives in the latter half of the war. 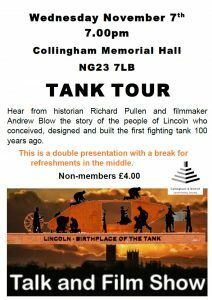 Richard Pullen became interested in the tanks because his grandfather worked at William Foster and Co. of Lincoln from 1916. Fosters (with the help of Major Walter Wilson) were inventors and manufacturers of the world’s first tanks. Andrew Blow’s interest came from the discovery of rare 1918 film of the tanks taken on the Lincoln testing ground. This entry was posted in Meeting Reports, WW1 Armistice on 7th November 2018 by Christine. This entry was posted in Publications, WW1 Armistice on 7th November 2018 by Christine. The Great War Trail was devised by the Society as part of the Armistice Commemorative programme over the summer of 2018. 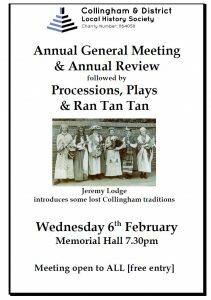 It follows a path starting and ending in the Cooperative Car Park and taking the walker on a circular tour of High Street, South Collingham (as far as the church), along Low Street up to the Grey Horse, then back along the High Street to the car park. Along the route shops, schools, buildings of importance such as the Memorial Hall, and houses of the soldiers who left the village to fight in the Great War are pointed out, and a back story given where appropriate. Pictures are included to enrich the walk. 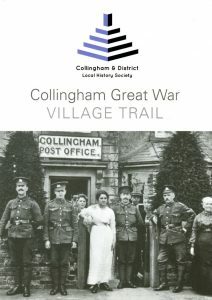 The Trail was sponsored by the Heritage Lottery Fund via the Collingham Parish Council. It was delivered to every household in Collingham. 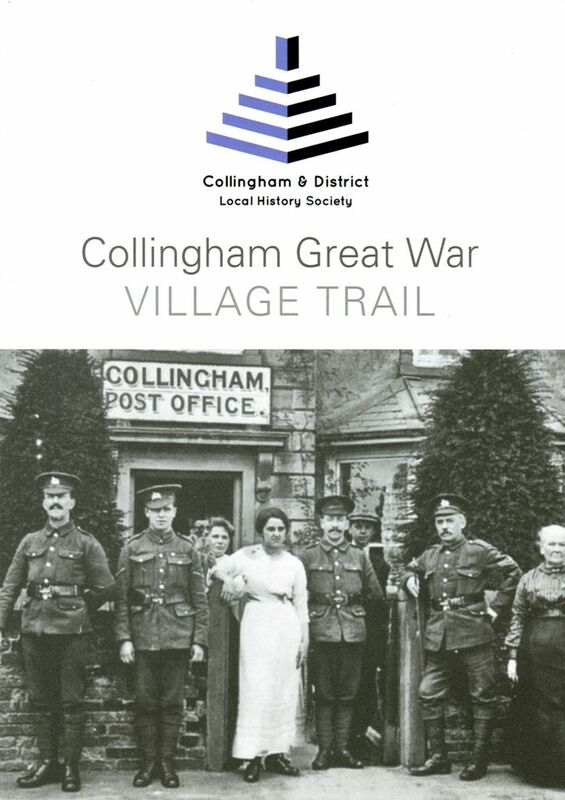 While the Village Trail is centred around the Great War, its value as a heritage resource enabling villagers to understand how the village appeared 100 years ago cannot be underestimated. 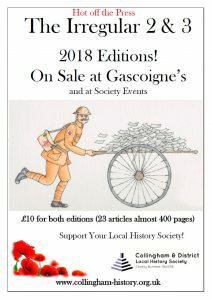 TRAIL LEAFLETS ARE AVAILABLE IN THE ARCHIVE. PLEASE CONTACT THE ARCHIVIST IF YOU NEED ONE – ALTERNATIVELY A PDF VERSION CAN BE DOWNLOADED HERE. This entry was posted in Publications, WW1 Armistice on 5th November 2018 by Christine. 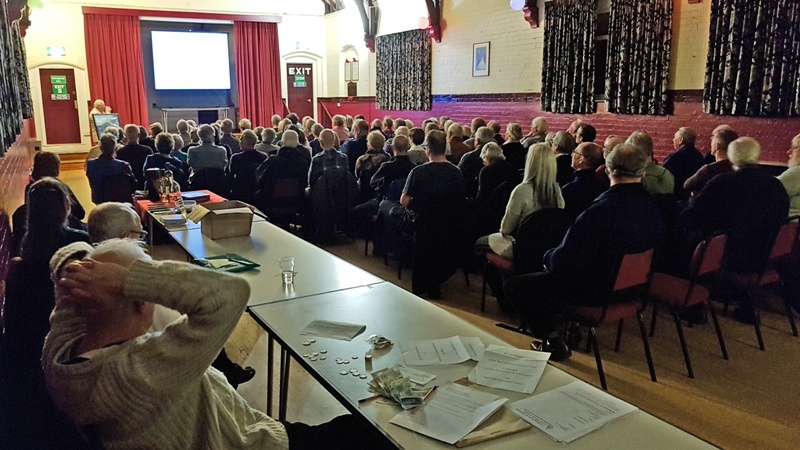 The Society’s meeting of 3rd October was a double bill, telling two very different stories of travels to theatres of war where local soldiers lost their lives. 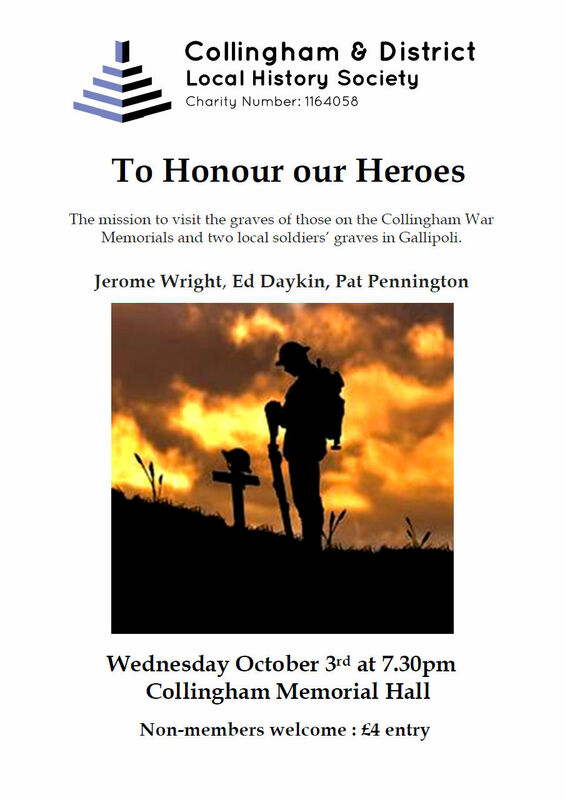 Pat Pennington had a personal mission to follow in the footsteps of her late husband’s uncle, Private Michael Herbert Edmonds Colton who fell at Gallipoli, whilst Jerome Wright visited the graves and monuments commemorating the local men who were lost on the Western Front. The name of Private Michael Herbert Edmonds Colton, stretcher bearer in July/August 1915 with the 1st Sherwood Rangers, can be seen on the Helles Memorial. Pvt. Colton was 21 years old when he fell at Chocolate Hill. He may have been particularly suited to caring for the injured due to his first- aid experience gained through his membership of the Scouting movement. This entry was posted in Meeting Reports, WW1 Armistice on 3rd October 2018 by Christine. A successful event which attracted an audience of over 100. Many stayed afterwards for light refreshments and stimulating conversation. This entry was posted in Meeting Reports on 18th July 2018 by Christine. 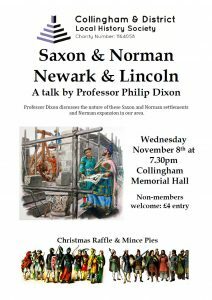 With his easy style Professor Philip Dixon took us on a relaxed tour of Anglo Saxon and Norman Lincoln and Newark which drew heavily on his personal experience as a leading archaeologist and expert in historic architecture over many decades. 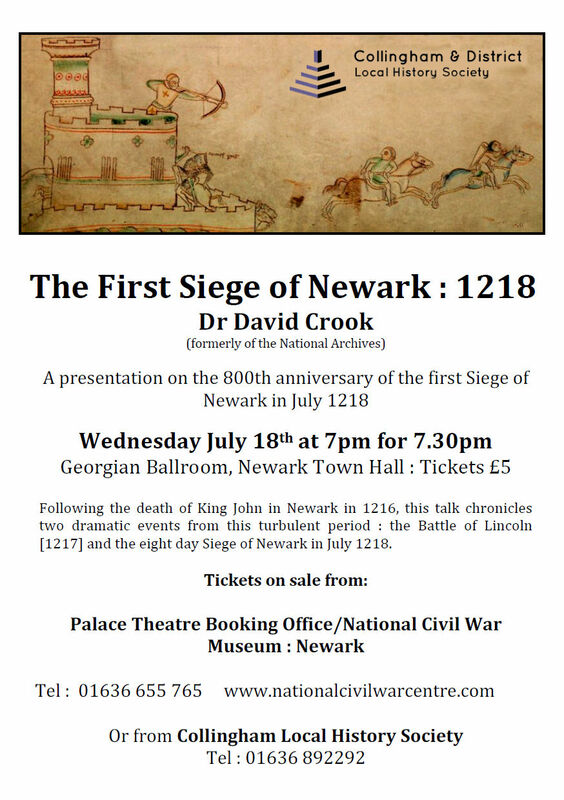 Professor Dixon’s use of superimposed maps was extremely useful in aiding our imagination to appreciate the earliest origins of Newark around the Saxon ‘Burgh’ site and later Norman castle and church. The early development of Lincoln cathedral, for whom he currently acts as an archaeological consultant, was also analysed in detail. 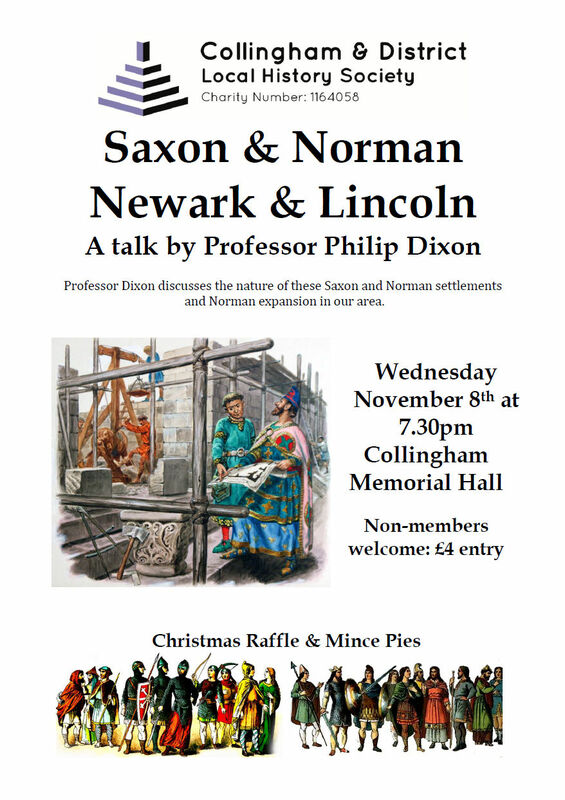 Professor Dixon told us about a book he is currently writing on this topic which several of us will be queuing up to purchase. This entry was posted in Meeting Reports on 8th November 2017 by Christine.